Leaving the performance we walked up the hill to Hallgrímskirkja, the impressive concrete cathedral which dominates the Reykjavik skyline. 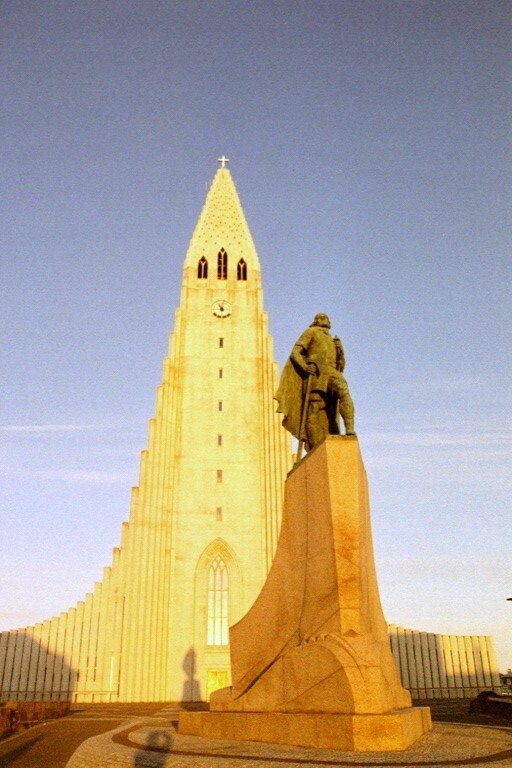 The statue of Leifur Eiriksson is the work of the American sculptor Stirling Calder, Alexander Calder’s father. Note the brilliant sun showing clock hands at 11- at night! A perfect introduction to Icelandic history was the dramatic one woman play The Saga of Gudridur, which we saw the evening of the day we arrived. Written and directed by Brynja Benediksdóttir and performed by talented actress Þorun Erna Clausen, this fast moving and engrossing production tells the story of a historical Icelandic woman, Gudridur Thorbjarnardóttir. Gudridur, a newly converted Christian, was one of the earliest settlers of North America and by tradition bore the first European child, a son, Snorri, in the New World, about the year 1005. Based on the Saga of Eirik the Red and the Greenlander’s Saga, the play depicts her travels from Iceland and Greenland, the various struggles against hard Winters, treacherous seas, personal misfortunes (Gudridur weds three times in the first few years of her womanhood; she is widowed twice due to illness) and finally the violent indigenous peoples of Vinland (“land of the vines”- likely Newfoundland) that the Icelandic settlers seeking new lands to the West faced. Gudridur’s second husband is no less a personage than Thorsteinn, the brother of Leifur Eiriksson, the Lucky. Although Vinland was not perhaps the mild fruitful land of her dreams the small settlement recently unearthed at L’Anse aux Meadows may have thrived and grown if the native population, who the Greenlanders named skraelings, had not proved too violent for the settlers. (Gudridur and her small party may have settled even further South, possibly along the coast of New York State, but the indigenous peoples again proved unfriendly.) History does not often record that a Viking people sought peace from a neighbour and were themselves driven off, but that is what happened in the New World. Gudridur returned to Iceland with her third husband, in old age became a respected nun, and true to her adventuresome spirit, even undertook and completed a pilgrimage to Rome for Papal blessing. This acclaimed presentation, in English, required minimal props and scenery and was enhanced with dramatic sound effects at a small theatre, the Skemmtihusid, in downtown Reykjavik. It perfectly conveyed an era of rapid change and discovery – Christianity had been adopted en masse and under threat of force in Iceland in the year 1000, and Gudridur is as ardent a convert as her friends and relations are heathen. One scene which was particularly memorable is taken from the Saga of Eirik the Red and concerns Gudridur being impressed into the service of a völva or seeress. The völva needs to enter her soothsaying trance to the accompaniment of certain ritualistic traditional chants called varðlokkur, “ward chants”, and only Gudridur, a Christian now forbidden to sing these songs, knows them. The varðlokkur were sung to attract spirits to the seeress so she could transmit their wisdom. For the survival of her starving village Gudridur sings “so well and beautifully that people there said they had never hear anyone recite in a fairer voice” according to Eirik’s Saga, and the völva delivers her message.